The whistling wind whooshed wildly in London on this cold Christmas morning. Throngs of people rushed past the empty shops, which lined the snow-covered streets. Bells chimed continuously as the solemn masses pushed hastily toward the warm church. Among them were Sir Ector, who was an intrepid knight, and his two sons: Sir Kay, also a knight, and Arthur, an 18-year-old squire. The people felt anguish because their king has sadly passed on, and he didn’t have an heir, so the throne was vacant. They were bewildered as to who would be king. Abruptly, the church started vibrating and quaking, and the gasping people heard a thundering boom and saw sparkling light. They bolted outside and witnessed a massive white stone. On top of it was a ravishing sword embellished with jewels. The archbishop read the stone’s words, which said, “Whoso pulleth out this sword will be the rightful king of all England.” The knights tried to dislodge the blade, yet none could. Instead, the solid sword stuck steadfastly in the stone. In London on New Year’s Day, there was a tournament. Charming ladies in fancy dresses laughed happily, while armor-clad knights devoured delectable turkey and drank strong, heady ale. Stunned, Arthur realized that he forgot Kay’s sword. “Sorry, brother. I’ll go get it,” explained Arthur, who was resolved to make it right. On the way to the inn, Arthur passed the church and decided to take the beautiful sword instead. Kay was enraged and rebuked Arthur because it wasn’t his worthy sword, and Arthur confessed that he had really gotten it from the stone. The people didn’t believe him, so they took the squire back to the churchyard, where he put the sword back in and then pulled it out easily. 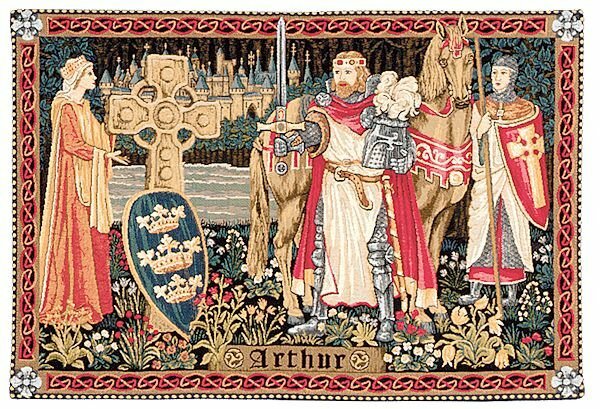 Everyone bowed and extolled Arthur as king!